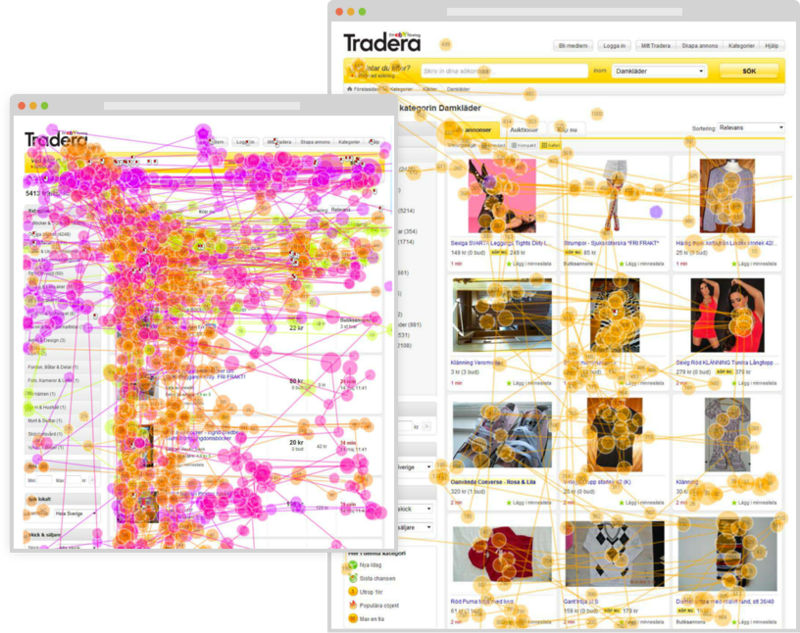 As part of a larger analysis of Tradera (Ebay Sweden), I was invited to carry out an eye‑tracking study. The results could be combined with an analysis of visitor statistics and give a detailed action plan, as well as several new insights into user behavior online. Tradera is part of Ebay and is Scandinavia’s largest e-commerce and auction platform online. With the ambition to create a more modern auction site, the goal was to have ads from individuals and special offers from companies joined together to achieve a strong e-commerce experience. Through analyzing visitor behavior, Tradera wanted to gain insight and create a basis for a more strategic approach to their work. I was invited to map user behavior, along with analysts from Conversionista. The analysis of visitor statistics and user testing with eye-tracking was carried out in parallel, but I presented my analysis and report independently from the results of visitor statistics analysis. The results were then combined, with results that were astonishing, to say the least! What insights can we gain by comparing eye-tracking and web statistics analysis? Our challenge in this project was to uncover hidden facts and provide insights that could guide the client in important strategic decisions, and to give them clear tools for prioritizing their development resources. The study found, unsurprisingly, that users spent a lot of time going through the product lists in search of what they were after. Some product groups were presented in the so-called Gallery View, where large images are displayed with text underneath. Other product groups were shown in a list, with the image to the left and information to the right, and a button to submit bids furthest to the right. The eye movements showed that the categories that were presented as a list required more from the users and that the list layout forced the users to keep shifting their gaze back and forth several times, to take in information about a product. The brilliant solution 1: After the study was completed, we compared the results with web statistics and could see that the categories with the default list view converted worse than the categories presented in the gallery view.